Bulawayo Chief Fire Officer Mr Richard Peterson has retired after serving the city for 11 years. He retired together with Mr Charles Mawariwande who joined the department in 1975. The two each received $2 000 from their colleagues, retirement certificates and were taken on their last official tour of the Fire Station in Famona. Mr Peterson who joined the local authority at the height of economic meltdown in 2008 said he leaves a happy man as he managed to oversee the equipping of the Fire Services department, now ranked among the best in the country in terms of service delivery. Acting Town Clerk Mrs Sikhangele Zhou announced Mr Peterson’s retirement on Friday during a handover ceremony for donations by Operation Florian, a charity set up by British fire-fighters to save lives overseas by donating reconditioned fire engines and emergency equipment to other regions in the world at Famona Fire Station. She said the highly beneficial partnership between the city and Operation Florian was Mr Peterson’s brainchild. 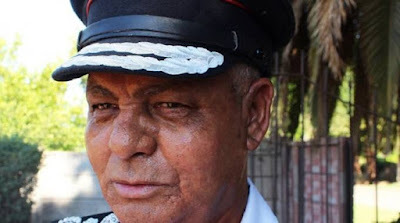 Mrs Zhou who is also head of the Fire Services department said Mr Peterson officially retired on December 31 2018 but was given a three-month contract extension which expired Friday. “We recruited Richard Peterson to be chief fire officer in 2008. He was brave enough to assume duty in May 2008 when the Fire Station had nothing. He had the challenge therefore to revive it and that is why we then started looking for partners and finally the mission (Operation Florian) started in earnest in 2011,” she said. She said the Bulawayo Fire Brigade extends support to other regions as in the past they have been forced to offer services throughout the Matabeleland region and Midlands province. ‘‘Of note you will know that Victoria Falls, one of the Seven Wonders of the World would sometimes be unable to host international events because international events require you to assure our international visitors that they will be safe. In the last UNWTO hosted with Zambia, Bulawayo (Fire Brigade) had to go to camp for two weeks to give assistance to our brothers in Victoria Falls,” said Mrs Zhou. Mr Peterson thanked his superiors and colleagues for the support they rendered to him during his tenure as the Chief Fire Officer. “I came in 2008 and we had nothing as an emergency service but I told myself that I’m notoing to give up so early. I can’t come in and go out without having fixed things,” he said. “We are here celebrating the work of Operation Florian and of course we are also celebrating my exit. I’m happy because I can look back and say at least we have done something with the Chamber Secretary and for your information we dominated at Megafest as an emergency service we got an award as the best emergency service provider . “We also received a leadership award that had my name but it wasn’t mine, it was for the team because I work with the team,” said Mr Peterson. He thanked Operation Florian for the support they have rendered to Bulawayo and other local authorities in Zimbabwe.